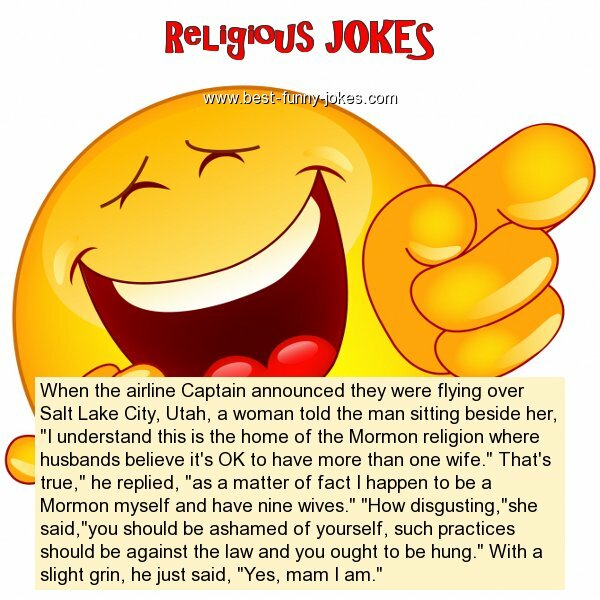 When the airline Captain announced they were flying over Salt Lake City, Utah, a woman told the man sitting beside her, "I understand this is the home of the Mormon religion where husbands believe it's OK to have more than one wife." That's true," he replied, "as a matter of fact I happen to be a Mormon myself and have nine wives." "How disgusting,"she said,"you should be ashamed of yourself, such practices should be against the law and you ought to be hung." With a slight grin, he just said, "Yes, mam I am."